It was doubles all round for trainer Colin Bowe and jockeys Barry O’Neill and Jamie Codd at the North Down Hunt Club Point-to-Point at Kirkistown, County Down on Saturday. Bowe took the wraps off 5-4 favourite Hell’s Canyon who made an impressive debut for Gigginstown in the Dennison Commercial Maiden For 4YO. The grey son of Martaline made good headway on the inner to lead before two out and soon moved clear under O’Neill. He duly tanked home by 10 lengths from Favori De Champdou who made a mistake at the last. Bowe said: “He’s gorgeous, he’s a very relaxed horse. He has a good brain on him and the ground being a bit slow suited him as well. Bowe and O’Neill sealed their brace through Fort Worth Texas (6-4) in the Old Manor Mill Mares Winners Of Two race. After the five-year-old slammed Gold Time by eight lengths, Bowe said: “Barry said she was quick through the air. She’s going to go to the track in the summer, we just thought we would give her a bit more experience with the point-to-pointing. Codd sent Peter Fahey’s Gold Des Bois (4-5 favourite) on after the penultimate fence in the Albert Bartlett Maiden Race For 5YO Geldings and the pair had enough in the tank to repel fast-finishing Lowtown Charlie by a length and a half. The jockey also landed the featured James Murdoch Contracts Open Lightweight Race on even-money-favourite Kruzhlinin. The 12-year-old gelding responded well when challenged by Winged Leader to draw eight lengths clear at the line. This was his sixth success ‘between the flags’ for Gordon Elliott after a career in England that saw him win at Grade Three level over hurdles when trained by Philip Hobbs. Codd said: “It was a muddling race as they didn’t go that quick but he did it well. “He’ll keep racking up the Opens and see where that takes him. Sarah Dawson’s Rubiana made all for Declan Lavery to take the honours in a eventful Greenville Electrical Maiden Race For 5 &6YO Mares. Just two of the six horses completed the course as out in front proved the best place to be. Rubiana jumped well as she put Cream Sparkles away by two lengths to win at 7-2. Brian Lawless steered Lough Derg Lyric home by five lengths in the concluding John Beers Recovery & Commercial Repairs Maiden Race For 6YO & Upwards for his father, trainer Gerard Lawless. 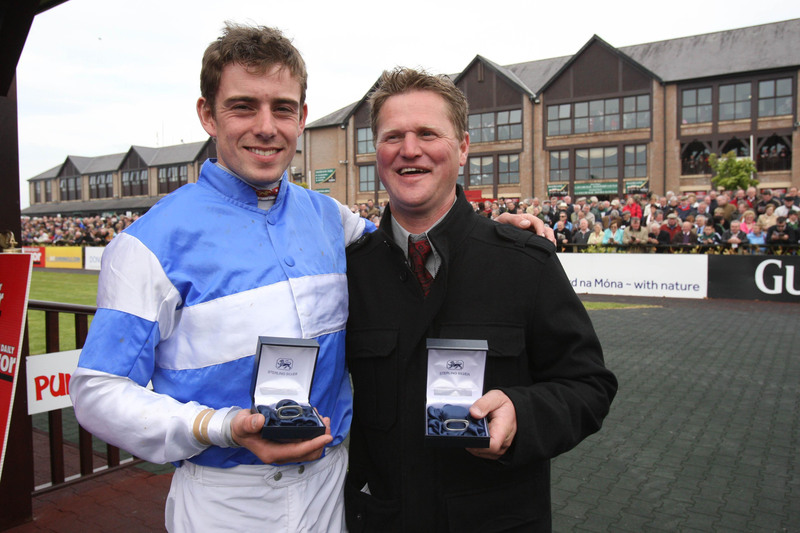 The County Wicklow jockey said of the 5-2 shot: “He’s race fit, jumped well and travelled well throughout. “He quickened up going to the second last and travelled away into the straight and stayed galloping.